Violence tears apart too many young lives in minority communities, but interventions at crucial times can help reduce such violence and its effects, Dr. Michael Moncure said at the 2018 Dr. Reaner & Henry Shannon Lecture, held Feb. 23. In his presentation at the UMKC School of Medicine, “Factors Associated With Interpersonal Violence in Minority Communities,” Moncure recounted anti-violence efforts from his career as a trauma surgeon. And he praised and drew hope from such recent efforts as Kansas City’s AIM4PEACE, which de-fuses violence with effective actions backed by research. The direct results of violence are devastating, Moncure said, citing Centers for Disease Control statistics for 2015: 44,000 suicides; 17,000 homicides; and $107 billion in lost wages. In Kansas City, Missouri, he noted, homicides spiked in 2016 and remained high in 2017. The toll on minority communities can be devastating, and particularly tragic when young lives are lost or disrupted. Moncure, a professor in the Department of Surgery at the School of Medicine, said his first job was in Camden, New Jersey, at the time notorious for crime and poverty. Moncure got involved with a program much like the TV show “Scared Straight,” which showed young people in high-crime areas how bad life could be if they committed violent crimes and were imprisoned. “Those programs had some splash, but they weren’t evidence-based,” Moncure said. The programs ultimately were ineffective. “We even got a little cocky, and shared some of our materials with adults” in the criminal justice system. It was a reality check, he said, when those adults were unimpressed and even incredulous that Moncure and his colleagues thought their efforts would have any effect. Research on violence and trauma and their causes and effects has come a long way since then, Moncure said, and trauma has come to be seen much more broadly than shootings or other violent crimes. Many studies have associated both recurring violence and adult diseases such as cancer, diabetes, heart failure and hypertension with the number and severity of someone’s ACES — adverse childhood experiences. ACES include poverty, divorce, and incarcerated parent, violence in the home and sexual abuse. But research also has shown that interventions to support trauma victims at the right times can reduce the effects of such trauma and often prevent more violence. For example, Moncure said one shooting often leads to another in retaliation. But an intervention specialist quickly summoned to a hospital bedside can help the wounded person and calm friends and relatives who might think they know who fired the shots and are bent on revenge. In Kansas City, Missouri, Moncure said, the AIM4PEACE program specializes in such interventions, builds healthy relationships and gets results. Those efforts also are part of a community-wide plan that includes social support, counseling, job training and other efforts to combat violence. Another benefit of having research behind these efforts is demonstrating that they are cost-effective. Moncure believes this has helped get support from the Kansas City business community. Henry and Dr. Reaner Shannon sponsor the annual lecture, given Feb. 23 by Dr. Moncure. Thankful to be part of the annual Dr. Reaner and Mr. Henry Shannon Lectureship in Minority Health, Moncure noted that the series, developed to create awareness about health disparities affecting underserved and minority communities, encouraged exploring solutions to society’s problems. “There’s no better use of science,” he said. 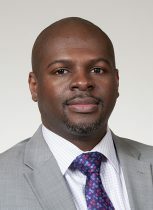 School of Medicine Dean Steven Kanter, M.D., is pleased to announce that E. Nathan Thomas, previously the chief diversity officer for the University of Kansas, has joined the School of Medicine as the new Associate Dean for Diversity and Inclusion. A highly successful educator, administrator and entrepreneur, Thomas served as vice provost for diversity and equity at Kansas since July 2014. Before that, he was the first campus diversity director at the University of South Florida Polytechnic, and was founder and a consultant with Invictus Human Capital Management in Florida. At Kansas, Thomas provided leadership in diversity, equity and inclusion for 21 non-academic and academic units. He expanded the program from a campus-wide to a system-wide model that encompasses four of the university’s campuses, including the medical school. He was responsible for implementing a Diversity Leadership Council work group to execute system-wide diversity efforts and developed work groups to coordinate diversity education and training for all new faculty, staff, and students. While at South Florida for nine years, Thomas developed the first campus diversity office. His efforts included a mentoring program to enhance the retention of a diverse student body, a diversity advisory group of faculty, staff, students and community members, and a successful multi-university grant proposal designed to increase the number of women and minorities in technology disciplines. Thomas received his bachelor’s degree in psychology and a master’s in community/clinical psychology from Norfolk State University. He completed his Ph.D. in ecological-community psychology at Michigan State University. 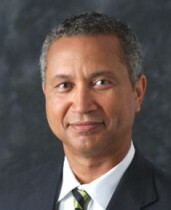 Thomas began his new role at the UMKC School of Medicine on December 18. Daphne Bascom (right), M.D., Ph.D., talked after her lecture with an audience member. The sponsors of the lecture, Henry and Dr. Reaner Shannon, listened in. The 2017 Dr. Reaner and Mr. Henry Shannon Lecture in Minority Health, given by Daphne Bascom, M.D., was filled with compelling statistics and fresh insights into the importance of community health efforts. It also reinforced an old saying: An ounce of prevention is worth a pound of cure. Bascom, the senior vice president of community integrated health for the Greater Kansas City YMCA, focused her lecture, “Collaborating Across the Continuum to Create a Healthy Community,” on efforts to combat obesity. “The connection between rising rates of obesity and rising medical spending is undeniable,” said Bascom, who spoke Feb. 24 at the School of Medicine. But she also noted that investing just $10 per person in community efforts to reduce obesity could pay off in an estimated $16 billion in annual health care savings. — Annual obesity-related health care costs are estimated at $315.8 billion, with $14.1 billion related to childhood obesity. — Businesses lose $4.3 billion a year to obesity-related absenteeism. — Average health care costs are 42 percent higher for obese people. — More than one in three U.S. adults are obese, and obesity rates are worse for black and Latino adults. — Kansas had the 7th worst rate of adult obesity, and Missouri was tied for 10th. Bascom, a board-certified specialist in otolaryngology and head and neck surgery, also related her own career experience with the need to “build a better bridge” for integrating community institutions with the health care system. So Bascom, who received her medical degree at the University of Pittsburgh School of Medicine, looked for broader ways to improve people’s health. 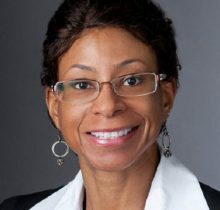 She came to Cerner Corp. as chief medical officer, where she provided strategic consulting services on how to use health information technology to improve quality, safety, operations and the fiscal health of their organizations. Now at the YMCA, Bascom is developing and promoting health partnerships and sustainable programs One area the Y is promoting? Reducing obesity—including working with families, improving access to affordable healthy food, providing safe places to be physically active, and curbing exposure to marketing of less nutritious foods. 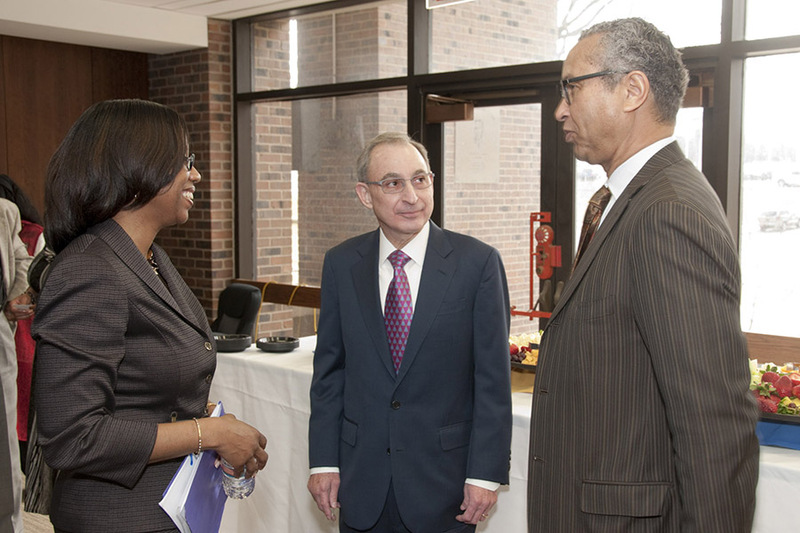 J. Nadine Gracia, M.D., M.S.C.E., deputy assistant secretary for minority health, spoke with School of Medicine Dean Steven Kanter, M.D., and Samuel Turner, associate dean for diversity and inclusion, before presenting the 11th annual Dr. Reaner and Mr. Henry Shannon Lecture in Minority Health. 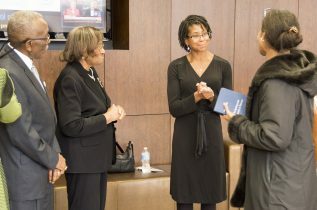 J. Nadine Gracia, M.D., M.S.C.E, deputy assistant secretary for minority health, presented the annual Dr. Reaner and Mr. Henry Shannon Lecture on Feb. 26 at the UMKC School of Medicine. A leading government official for minority health in the United States said Friday that while the country has made strides toward narrowing the gap in health equality, there is still work to be done. 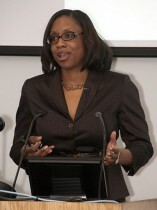 As deputy assistant secretary for minority health and director of the Office of Minority Health at the U.S. Department of Health and Human Services, J. Nadine Gracia, M.D., M.S.C.E, plays a major role in the development and implementation of government programs and policies to battle health disparities in the United States. 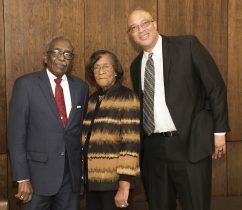 “Our goal is not only to close the gap, but to make sure that everyone has the opportunity to reach their full potential of health,” said Gracia, who delivered the UMKC School of Medicine’s 11th annual Dr. Reaner and Mr. Henry Shannon Lecture in Minority Health. Gracia offered a brief overview of her office and how it looks at the disparities in health and health care in the country. She called this year a landmark for the office, which is celebrating its 30th anniversary of working to improve the health of racial and ethnic minorities. She outlined many of the factors, from changing demographics to the various economic barriers, which play into the health discrepancies still seen in today’s population. “All of these factors make the mission and the role of the Office of Minority Health more urgent now than ever before,” Gracia said. A pediatrician with a focus in epidemiology, Gracia received her medical degree from the University of Pittsburgh where she was a student of current UMKC School of Medicine Dean Steven Kanter, M.D., and his wife, Leslie Borsett-Kanter, M.D. Gracia established herself as a leader on a national level while in medical school. With Kanter’s urging and support, Gracia rose to the position of president of the Student National Medical Association. She is a national president emeritus of the organization is also a past postgraduate physician trustee of the National Medical Association. She has since served as the chief medical officer for the Office of the Assistant Secretary for Health, providing program and policy leadership for a number of initiatives from global health to climate change. Gracia also served as a White House fellow and policy advisor to First Lady Michelle Obama on a program to battle childhood obesity. She has been named one of the 100 History Makers in the Making by the African-American news site, TheGrio, and one of Washington’s Powerful Women by the BET channel. Gracia said that under the current presidential administration, health-care priorities such as the Affordable Care Act and My Brother’s Keeper, a task force designed to ensure all youths have the opportunity to reach their full potential, have been implemented to keep Americans healthy and safe, boost scientific research and medical innovations, and to expand and strengthen the health care system. She also recognized the work taking place on local levels. Gracia applauded the efforts of physicians and researchers at the School of Medicine and throughout UMKC in addressing the issue of health equality in the Kansas City community. 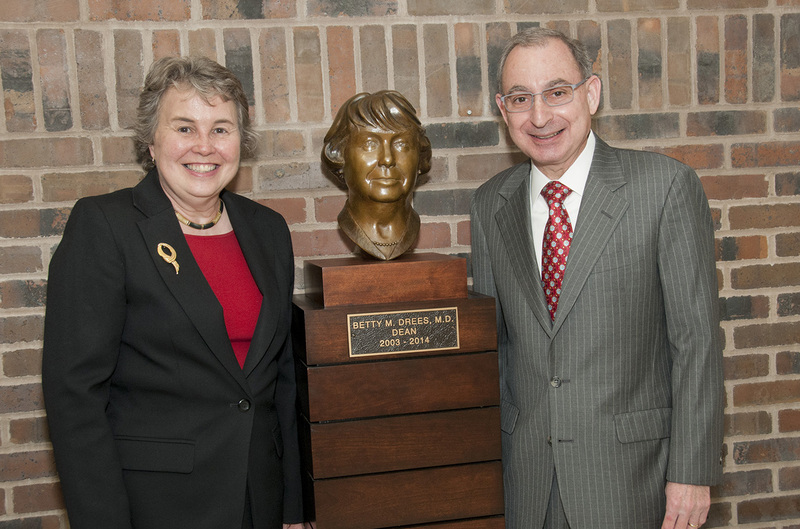 Betty M. Drees, M.D., left, and Dean Steven Kanter, M.D., pose with a bronze sculpture to commemorate Drees’ tenure as dean of the School of Medicine. The School of Medicine recognized Betty M. Drees, M.D., with the unveiling of a bronze sculpture honoring her long-time role as dean during a ceremony on Sept. 18. Drees stepped down as dean in 2014, after 13 years in the position. The unveiling ceremony coincided with an event to recognize School of Medicine faculty who earned promotions and tenure for the 2015 academic year. The event also included the presentation of faculty and student awards for excellence in diversity and in mentorship. Dean Steven Kanter, M.D., recognized Drees as an intelligent and caring leader and the consummate professional. “Through her guidance and leadership, the school stands ready to take on the challenge of the coming years,” he said. Drees was appointed dean of the School of Medicine in 2003, after serving two years as interim dean and one year as executive associate dean. She joined UMKC as associate dean for academic affairs and docent physician in 1998. From 2007 to 2008, she served as the University’s interim provost and vice chancellor for academic affairs. Under her leadership, the UMKC School of Medicine graduated more than 1,000 new physicians, increased research funding, and improved student success and retention. Drees saw the launch of new departments and programs, and completed expansions, renovations and upgrades throughout the medical schoo’s facilities. Under her care, the School of Medicine secured funding for seven new endowed chairs and professorships. 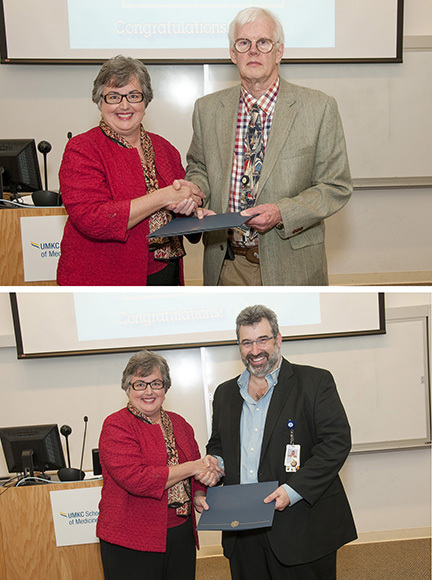 John Foxworth, Pharm.D., professor of medicine and assistant dean for faculty development, and Vincent Barone, Ph.D., associate professor of pediatrics, received the Dr. Betty M. Drees Excellence in Mentoring Awards. Foxworth received the Lifetime Achievement in Mentoring Award, given to a professor at the School of Medicine. He is an active mentor for residents and students in research efforts and has been a member of the School of Medicine faculty since 1983. He served on the faculty council as chair and is currently chair of the faculty development committee. Barone received the Excellence in Mentoring Award, recognizing an associate or assistant professor. He serves as associate director of the developmental and behavioral sciences medical fellowship at Children’s Mercy Hospital. He is also the director of developmental and behavioral sciences at the Children’s Mercy South. 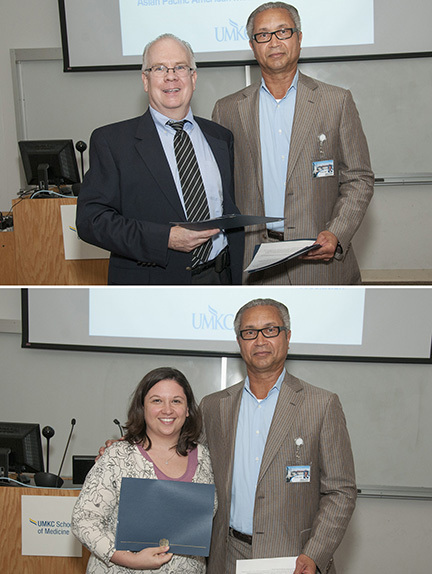 Jim Stanford, M.D., (top) and Cary Chelladurai, manager of Student Affairs, (bottom) accepted the Excellence in Diversity and Health Equity in Medicine Awards from Sam Turner, associate dean for diversity and inclusion. The Excellence in Diversity and Health Equity in Medicine awards were presented to two honorees: Jim Stanford, associate professor of medicine and Blue 5 Docent, and the Asian Pacific American Medical Student Association. The honors recognize the sustained and impactful contributions to diversity, inclusion, cultural competency or health equity by a student or student organization and by a faculty, staff, resident or department. Stanford is an infectious disease expert who has devoted a large portion of his clinical career to serving low-income adults living with or at risk of HIV and AIDS. He has served as research director for the Kansas City AIDS Research Consortium, provides care for HIV positive patients, and works with endocrinologists at Truman Medical Center to provide quality care in a culturally appropriate way for transgender patients. His clinical practice includes a growing number of patients who experience significant health disparities due to mental illness, substance abuse, poverty and low health literacy. The Asian Pacific American Medical Student Association has successfully fostered a diverse environment of education and learning for impoverished citizens, underprivileged children and those at risk for Hepatitis B. With more than 150 student volunteers, the organization has worked with local Vietnamese, African American, Indian, Sri Lankan and Pakistani communities, as well as the Kansas City African Chamber of Commerce that serves residents from 34 African nations. Through events including free health fairs and the wordwide Hepatitis Awareness Month, students have provided health care services for the community. Students also gain teaching and role modeling experience through these efforts. The 2015 class of Summer Scholars with program director Ken Beene (right) and program intern Vanessa Liddell (left). The 2015 class of Advanced Summer Scholars with program director Ken Beene (right) and program intern Vanessa Liddell (left). 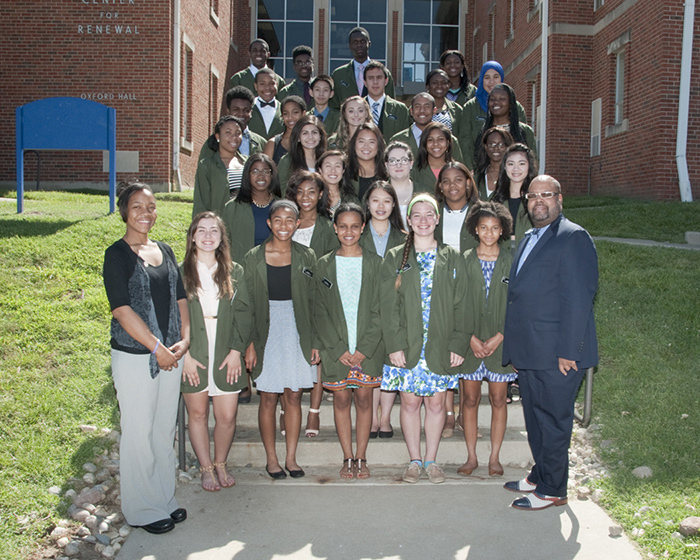 For the past month, 48 area high school students were immersed in the Summer Scholars program at the UMKC School of Medicine that many hope will be a springboard to their future as healthcare professionals. Summer Scholars celebrated its 35th class on July 31 with an annual awards luncheon and forum at Kansas City’s Guadalupe Center. Summer Scholars takes place each July offering basic science enrichment, exposure to various aspects of the health care field, interviewing and personal development skills, and preparing to apply to a medical school. It also provides the students the opportunity to interact with medical students and professionals. The program is made up largely of high school juniors and seniors and includes a group of Advanced Summer Scholars, attendees returning for a second session. 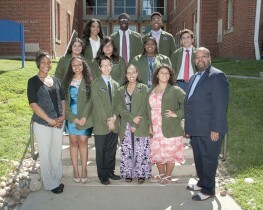 This year’s program welcomed 36 Summer Scholars and 12 Advanced Summer Scholars. As part of the awards ceremony and forum, students gave brief presentations of what they learned throughout the program and what they will take away from their month-long venture when they return to high school. Each student was also presented with an inspirational book and a certificate recognizing their efforts in completing the program. The event also included presentations from UMKC representatives on various topics dealing with attending college, obtaining financial aid and multicultural resources at UMKC. 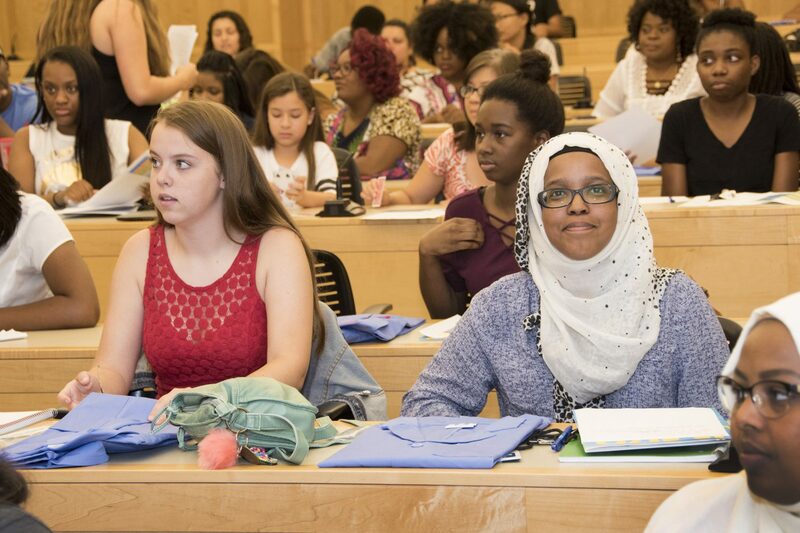 The Summer Scholars began in 1980 when former School of Medicine Assistant Dean for Minority Affairs Reaner Shannon, Ph.D., began an exploratory experience to encourage area high school students from underserved and minority backgrounds to consider health care fields. Nearly 5 percent of those who attend Summer Scholars go on to attend the UMKC School of Medicine, while a larger number will enter other health care fields, said program coordinator Kenneth Beene.